Windows 10 Redstone 2 builds will launch for PC first, for Mobile "a few weeks after"
The Windows 10 Anniversary Update has now been rolling out for PCs for a week, but a report that it would be released for Windows 10 Mobile devices today proved to be inaccurate. But Microsoft is already looking to the next phase of Windows 10 development. In a post on the Windows 10 Feedback Hub today, it said: "We are now getting ready to start releasing new builds from our Development Branch to Windows Insiders in the Fast ring again." It didn't say exactly when the first new builds from the Redstone 2 branch will arrive, but it did point out that - as with Redstone 1, which later became the Anniversary Update - it will start off by releasing Insider Preview builds for PCs first. 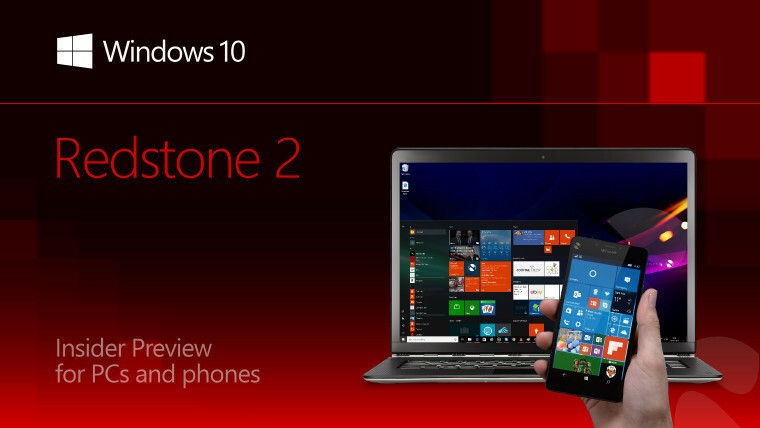 Windows 10 Mobile Redstone 2 builds will follow "a few weeks after". If you're not quite ready to jump into testing the earliest - and potentially, the most buggy - Redstone 2 builds, you can downgrade from the Fast ring to the more stable Slow or Release Preview rings instead. Alternatively, it's easy to temporarily (or permanently!) opt out of receiving Insider Preview builds altogether - check out our guide to find out how to do so.